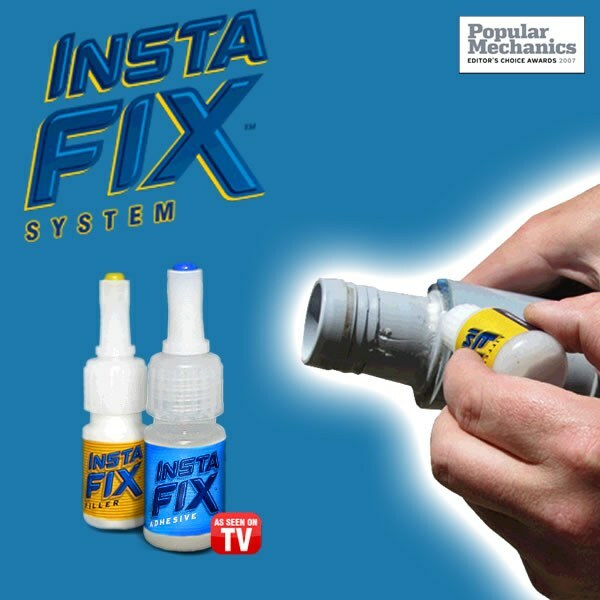 Insta-Fix Super Glue is sand-able, paint-able, 100% waterproof and more! Insta-Fix is a revolution in adhesive technology. Insta-Fix Adhesive bonds virtually any type of material in seconds; plastic, porcelain, tile, rubber, cast iron, wood, copper, vinyl, steel, glass, even leather. Not only that, it bonds these different materials to each other! Insta-Fix repairs are done immediately. No time waiting for the repair to dry. The job is finished in seconds. What makes Insta-Fix a phenomenon is NOXYBOND technology. That means no oxygen. When the oxygen is removed by pressing the two pieces together, Insta-Fix creates an incredibly strong bond - instantly. Only a drop or two of Insta-Fix Adhesive is required (there is a lot of repairing in that little bottle). Use only a drop or two, then press the pieces together to eliminate the oxygen, and it&apos;s done. Instantly. No curing. No waiting. On with the next job.